Will asks whether originalists should be heartened or troubled by Campbell’s debunking of Justice Scalia’s historical analysis in Printz. However, the majority opinion is not originalist at all. Scalia doesn’t address the historical materials with any rigor; he argues (quite candidly) that the anti-commandeering principle is consistent with the historical record, not that it emerges from the best reading of the historical record. Where does that principle come from? Precedent: “Finally, and most conclusively in the present litigation, we turn to the prior jurisprudence of this Court.” Scalia thinks that New York v. U.S. controls, and the weak foundation-era history provides no basis for overturning it. Would Scalia have switched sides if Campbell’s work had been before him? Hard to know, but I would not advise Congress that it is now free to commandeer. On The Federalist Papers, given the specific political use for which they were written and published, there is little reason to believe that they represent a general account of the original understanding as it existed in all 13 states. The reason that The Federalist has fetish-value today is simple: it has been cited over and over by the Supreme Court, and so has become a source of constitutional law that supplements the text and other materials. Would Madison have been pleased or embarrassed? Will says that the Supreme Court could have held in favor of Heller on simpler and more intuitive grounds than those laid out in Scalia’s opinion. 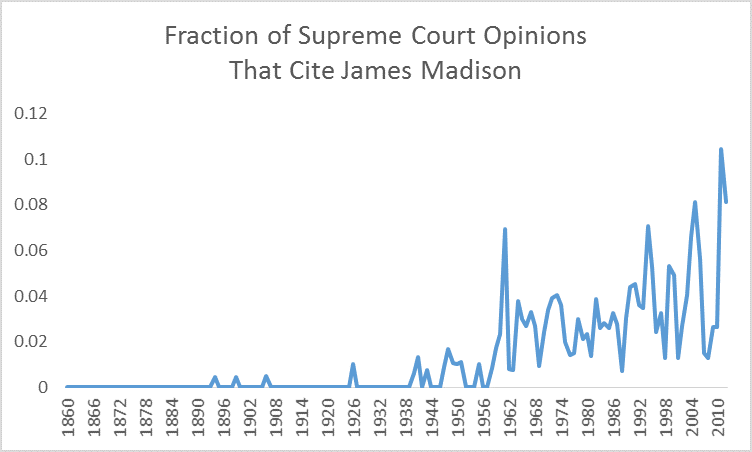 The purpose of my earlier post was not to argue that a well-reasoned originalist opinion could not be written but to point out that the actual opinions (by Scalia and Stevens) were poorly reasoned and written, and to raise the suggestion that originalism, as practiced by judges, lends itself to bad historical reasoning because judges are not historians but lawyers, and (by necessity) do law-office history rather than real history. Indeed, this very point about the difference between history and law-history is Will’s (“what seems like an intractable historical debate is really solved by a legal or interpretive question about what kind of history matters”). But if Will is right, this disconnects originalism from one of the theoretical reasons for its appeal. The very reason identified by Michael Rappaport, who says that originalism is appealing because the “idea that a written law should have the meaning that it had at the time of its enactment seems extremely intuitive and part of how we understand legislation and other written enactments.” Exactly: the real understanding, not the understanding that is constructed from legal rules that permit some types of evidence and exclude others–the presumptions, fictions, and tie-breakers that are necessary to facilitate decision-making and enhance the predictability of law. But this is in tension with his statement “the ordinary person is usually an originalist.” Maybe a historical originalist but not a law-office originalist. But I’m not so sure that the ordinary person is any kind of originalist, because it’s pretty clear that the ordinary person has all kinds of ideas about what his constitutional rights are that cannot be traced to the original understanding—for example, that the national government cannot discriminate on the basis of race, or that government can’t censor artistic expression that offends community standards. In fact, the direction of causation probably goes the other way: people read into history whatever constitutional rights they think they should have now. Our constitutional culture is the residuum of a struggle to reduce the cognitive dissonance between reverence for the founding generation and commitments to modern-day rights and government structure. Speaking of originalism, in Slate I criticize originalist arguments made in amicus briefs for the Noel Canning case, which will be argued next Monday. I fear that the Supreme Court’s Noel Canning opinion will be another Heller. 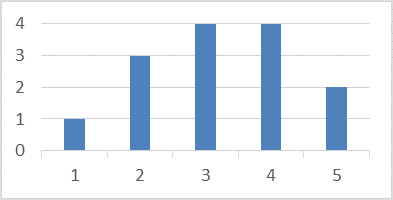 The blue line shows how often “originalism” appears in books from 1900 to 2010, and the red line shows how often “evolving constitution” appears. 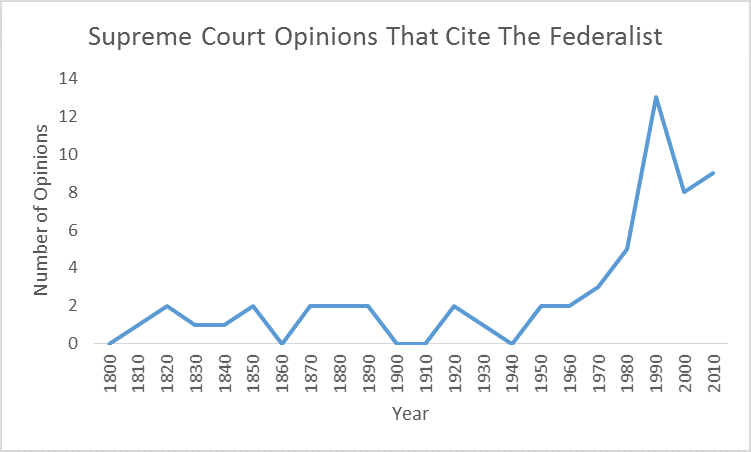 The sharp increase in references to “originalism” occurs after 1980. Courtesy Google ngram.